"Easy to prepare, this recipe is flavorful yet can pack a 'punch' if you choose. Squash tend to be mild but by adding diced green chiles (and jalapenos if you want spicier) it's a surprisingly tasty recipe. It pleases a lot of people and has become a favorite at family gatherings." Lightly grease a large casserole dish. Arrange the squash, onions, and red bell pepper in the dish. Place in the microwave, and cook on High 10 minutes, stirring once, until tender. Gently mix the mushrooms, green chile peppers, jalapeno peppers, cheese, and sour cream into the dish. 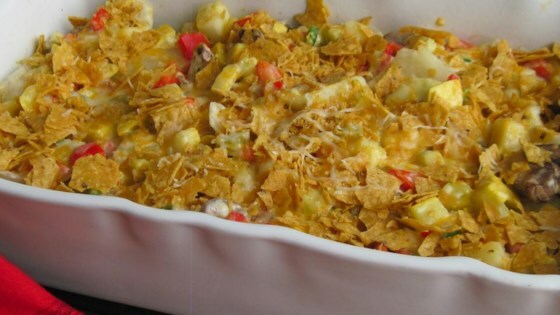 Sprinkle with crushed tortilla chips. Cover dish, and cook in the microwave 10 minutes on Medium-high power, or until cheese is melted and casserole is heated through. Delicious! I used fat-free sour cream, added left over cauliflower, fresh tomatoes, fresh spinach, left off taco chips and jalapenos, added a dash of red pepper.